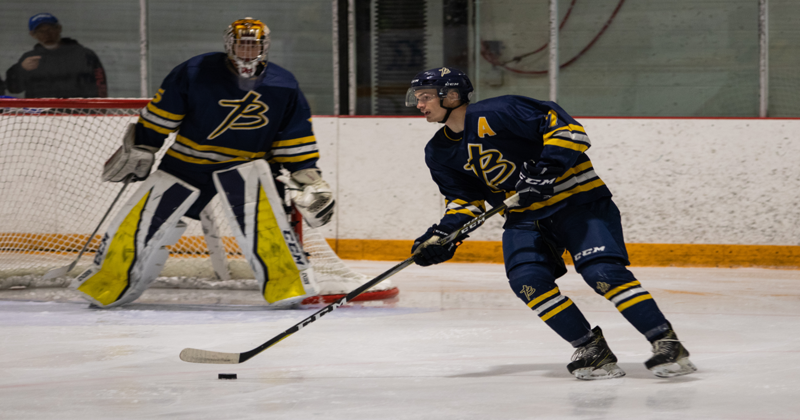 CARONPORT, SK - The Briercrest College Clippers face off against Portage College Voyageurs on Friday night at the Barkman Arena. This is the first league game against Portage; with two-exhibition games prior both ending in a 3-2 win for Portage. Portage College taking the win 4-1; #40 Dan Dekoning; Briercrest goalie and player of the game saying "[Briercrest] battled hard, giving up with a couple tough ones at the end; but looking to reset and come ready to play tomorrow"
The player of the game from the Briercrest Clippers was goalie #40 Dan Dekoning, and #21 Trevor Posch for Portage College Voyageurs.